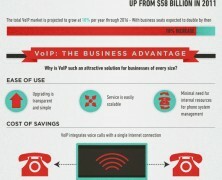 Home » Posts Tagged "VOIP"
This report examines the evident shift to VoiP services in the enterprise environment presenting the reasons that make VoiP more business-friendly that traditional landline. Analog or Digital, telephony services are integral part of our professional and personal life. This graph clarifies and compares the technology behind traditional PBX and VOIP phone systems and concludes with the benefits of the latter as the most advanced and cost effective solution to every scale.